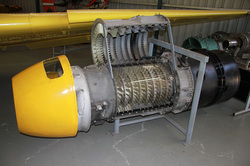 The Junkers Jumo 004 was the world's first turbojet engine in production and operational use, and the first successful axial compressor jet engine ever built. Around 8,000 engines were manufactured by Junkers in Germany during late WW2, powering the operational ME-262 fighter jet and the Arado AR234 reconnaissance / bomber jet, along with prototypes including the Horton HO 229 aircraft. Variants of the engine were produced in Eastern Europe for years following the war.